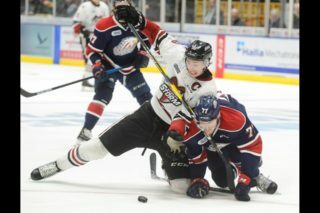 Wednesday night in front of a near capacity March Break crowd, the Storm picked up two crucial points with a tight 5-3 decision but the Erie Otters didn’t make it easy. With the win, Guelph sits all alone in seventh with 64 points and two games remaining. 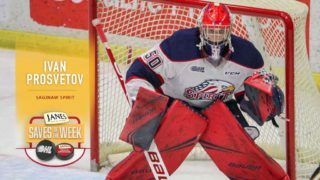 One point back are the eighth place Windsor Spitfires with three contests to play followed by the Soo Greyhounds at 60 points with just two more games. A couple of notable lineup changes for the home side as Tanner Richard returned from a long layoff and Brandon Foote made his first start since January 28th. The overage netminder was solid when he had to be in earning his first victory since November 5th in Sarnia. After Frank Menard opened the scoring just 2:49 in, the Otters replied with three straight tallies to grab a 3-1 lead just shy of the midway point of the contest. Johnny McGuire with a bouncer that fooled Foote and a pair of high, hard shots by Jake Evans and Dane Fox gave the Otters the two goal advantage. Down 3-1 as the second period wound down, the Storm could have easily been on top but for a run of goalposts that bounced the wrong way. 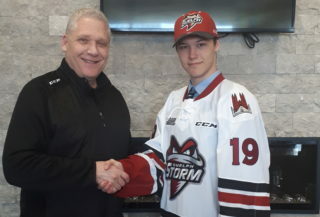 Finally, Richard’s return would pay dividends when the 18 year old winger skated over the blueline and fired a wrist shot behind Keinan Brown to pull the Storm within one with twenty minutes to play. The third period was all Guelph as they scored three times in just over 12 minutes to take control. Zack Mitchell with a long shot that handcuffed Brown tied the score before Menard banged in rebound on the powerplay to make it 4-3 Storm. With 4:44 remaining Richard also added his second of the evening as he took a pretty Patrick Watling feed and outwaited a sprawling Brown before wristing it from a sharp angle to give Guelph some much needed breathing room. The Otters pressed late with the net empty but couldn’t find the back of the net. 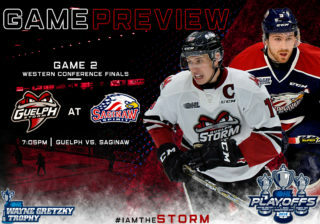 For the third time in a row, the Storm will kick off a home-and-home series against a Midwest Division opponent when they host the Owen Sound Attack on Friday night at the Sleeman Centre. 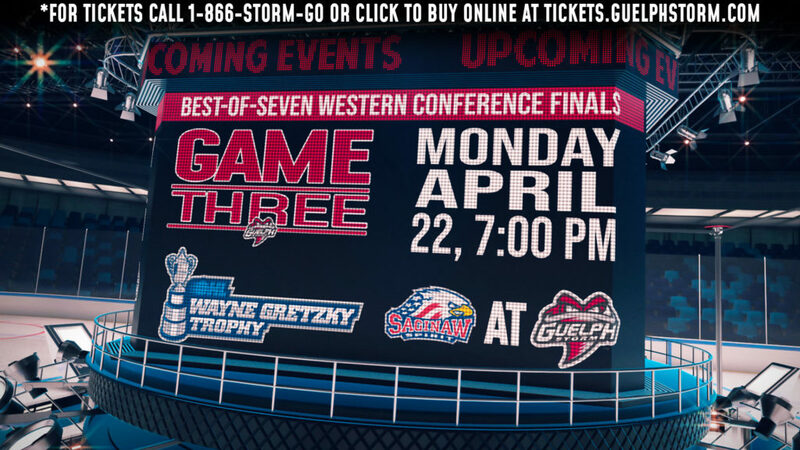 One night later, they’ll wrap up their regular season schedule with a return engagement in Owen Sound. 1st Period-1, Guelph, Menard 23 (Pedan, Mitchell), 2:49. 2, Erie, McGuire 2 (Cortellessa), 6:47. 3, Erie, Evans 12 (McDowell), 19:21. Penalties-Pedan Gue (slashing), 7:54; Gaskin Gue (check from behind), 13:25. 2nd Period-4, Erie, Fox 23 9:48. 5, Guelph, Richard 12 (Finn), 18:51. Penalties-Kosmachuk Gue (tripping), 1:44; McCarthy Er (roughing), 4:42; McCarthy Er (check from behind), 11:15. 3rd Period-6, Guelph, Mitchell 35 3:07. 7, Guelph, Menard 24 (Garlent, Mitchell), 12:59 (PP). 8, Guelph, Richard 13 (McNaughton, Watling), 15:16. Penalties-Harper Er (cross checking), 8:52; served by Crisp Er (too many men), 11:14; Fox Er (10-min. misc. ), 15:06; McGinn Gue (10-min. misc. ), 15:06; Garlent Gue (slashing), 16:43; Cortellessa Er (10-min. misc. ), 19:29; Crisp Er (roughing), 19:29; Menard Gue (roughing), 19:29. Shots on Goal-Erie 9-10-8-27. Guelph 15-14-12-41. Power Play Opportunities-Erie 0 / 4; Guelph 1 / 4. Goalies-Erie, Brown 0-2-0-0 (41 shots-36 saves). 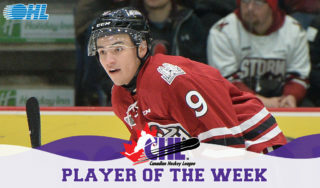 Guelph, Foote 4-6-1-1 (27 shots-24 saves). Referees-Keith Kaval (14), Kendrick Nicholson (22).